Gorgeous hand-tied bouquets maintain their shape better than vase-based arrangements, and look at home placed into any vase. They also make a lovely gift, presented without a fragile or heavy container. In this hands-on workshop, you’ll learn how to create an elegant hand-tied bouquet of sumptuous fall blooms. All materials are included. The completed arrangement will be approximately twelve inches wide. Payment is required in advance due to materials fees, and is non-refundable. This program is limited to ten people, and must have a minimum of four participants to take place. In the event that the workshop is cancelled, participants may choose to participate in another session. Ami Wilber became the floral and event décor designer at Hillwood in November 2016. 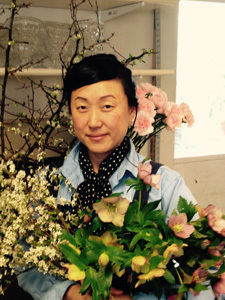 Ami has over twenty-five years of experience as a floral designer. She received a bachelor's degree in fine art from Miami University of Ohio and a Master's of Fine Arts from the Rochester Institute of Technology, School for American Crafts. Prior to joining Hillwood, Ami created sculptures and has exhibited her installations at galleries and public spaces in Washington, DC.